During that song [Steve Howe] took three steps back and almost disappeared. While he hadn�t much to do playing on that song, he looks quite unhappy, even at his attached solo at the end of "Owner". Well, I can fully understand that! Well, I was quite disappointed - not by the band, but by that lame strangelooking audience. It simply wouldn�t move. Only a few of these "Mauerbl�mchen", as we call such people in Germany, dared to make a shy dance. For me it was quite strange to feel the vibes of the music, to dance in-between all these boring people. And when they finally woke up, it was during "Roundabout", the last song of the evening. Next Yes concert will definitely be London or another place with vibes again! Howe is NOT sad. If he seems detached, it's because he is so deeply _concentrated_ on playing. I mean, listen to what he plays! He has to have that level of concentration. He's not trying to be a showman, he's "only" playing note-perfect music, adding his individual fills and florishes to the song texture. He's also _carrying_ the music, he's definitely leading the band. I think a lot of fans are taking Howe for granted and maybe just don't notice the mastery and the effort he must put in. He is just overwhelmingly involved. Billy's lead on IWBaGD caused the song to have _holes_ in it, which Igor filled. Apparently, cutting hair did not significantly improve his musical contribution. During Cinema, the first 'verse', Billy actually stopped playing his lead solo tune. Igor picked it up and finished it for him. Columbia Halle is standing room only, which is a pity, because there would have been several standing ovations. Perpetual Change: a very interesting interpretation, somewhere half way between the TYA original and the YesSongs take. The verses sound lighter, sweeter, more sing-song'y, which makes them contrast better with the energetic choruses. Howe's main solo is YesSongs-like but short; on top of that, Howe adds little melodies here and there that I'd never heard before. This version really deserves to be preserved on a live album. Igor adds a few bars of his "Dance impressions" solo as a prelude to the Awaken intro. Cool. Awaken - while I don't consider it to be one of the Yes pinnacles, it was really moving live. The "noodling" part - well, you just had to be there; Jon's hand-held harp and Igor's keyboards - not dueling, but making a dialogue. Perfect and very, very clear. Missing in action: Hearts and 9Voices. Shouldn't have dropped the latter. If anyone has recorded the Berlin show and wouldn't mind sharing it, please, please email me! 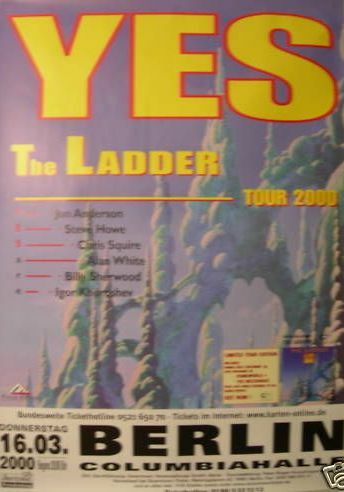 It was a great night, well worth the time and expense (one-way train fare to Berlin costs more than the Yes show ticket! ).